Add Pyramid Gold flats. But I think that the short scale adds to the tone. I have a 60s shell of an EB bass waiting for this treatment, but it needs extensive finish work before it's ready to start the routing and wiring. I have all the parts (including the Showman and Sunn w/JBLs) but not the time. Edwin , Yes indeed , The Pyramid Gold Flats . I have a few sets in my stash , Both Long Scale and Short . I think those strings added quite a bit to That sound to that we both know and can identify ! I know you like it too . Wolf, I haven't done any digging but I am very suspicious of the new Bi-Sonic that Guild is marketing. $99 apiece apparently. I dug a little and came up with this thread from Let's Talk Guild. I don't like to be negative but I personally wouldn't expect much from them. Harry _____@ $99.00 a piece is cheap in deed , Perhaps in sound as well ! As you say . However my plunge router is already smiling to do some work ! They even offer a router template . How nice of them . 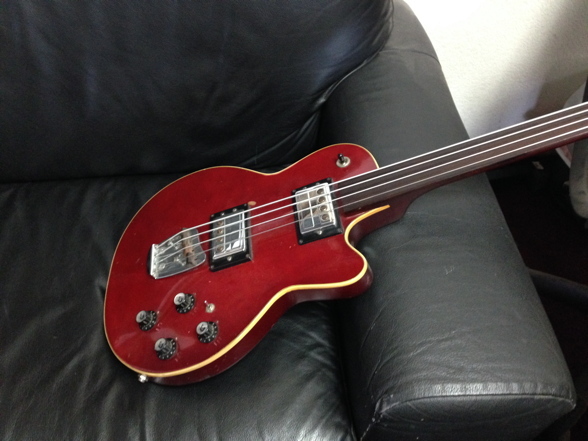 The experimental cadaver body might be an Epiphone long scale EB -3 . Not a Vintage 60's Gibson. I have to sleep on this anyway . Edwin , I think those new Guild BI -Sonics , must be at least, a bit better then those Epiphone EB-3 pickups , I would think ( hopefully). I seem to have so many irons in the fire ! LOL ___ If nothing else , Mr. Plunge Router will have had his dinner ! And if nothing else, you'll have excellent holes routed for Dark Stars, Curtis Novaks, or even Alembics! My suspicions about the new Bisonics is that their resistance is so low compared to the old ones, but that doesn't really mean anything. You just don't know until you get them in there. Wolf, you would actually be doing everyone a great service! Could you record the bass with the current stock pickups, then record it under similar conditions with the Guild Bi-Sonics? I'll have to do that with mine b/n the humbuckers and whatever gets put in! Edwin , Yes I agree . Harry , Ok,I can do a before & after recording. I have a feeling that , before may end up to be much sooner then ,after. Details to be worked out, but this bass will be Alembicized to some extent! I have one of Curtis Novak's BiSonics in a Jerry Jones bass. It's very fat and warm sounding. I don't have much luck with it on tunes that need a quick attack, but for everything else it's pretty special. I'm intrigued to see Guild has reissued the BiSonic for $99. At that price it's very tempting to try. The Novak one I got has the coil tap to go from vintage to Dark Star specs. The lower output setting is the one I use most. I put anniversary electronics in my Starfire that Alembic finished for me a few months ago. It's a potent and versatile package for sure. I look forward to seeing what you do with this lovely bass!